At the invitation of the U.S. government, CTBTO Executive Lassina Zerbo is currently visiting the U.S. nuclear labs, the Nevada National Security Site (formerly Nevada Test Site) as well as Stanford University and the Monterey Institute of International Studies from 19 to 26 November 2015. During his visit to the Lawrence Livermore National Laboratory (LLNL), Zerbo was welcomed by LLNL Director William H. Goldstein and viewed the laboratory’s contributions to CTBT verification, such as device for detecting radioactivity during on-site inspections and innovative seismic monitoring techniques. 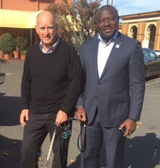 While in California, he met with the State’s Governor Jerry Brown to discuss cooperation on raising awareness for the Comprehensive Nuclear-Test-Ban Treaty (CTBT). The State of California is host to the 4 of the 38 International Monitoring System facilities hosted by the United States. In Nevada, Zerbo visited the National Atomic Testing Museum and toured the Nevada National Security Site, where he viewed the crater from the 1962 Sedan nuclear test and the tower of the cancelled 1992 Icecap nuclear test. During his visit to the United States, Zerbo also visited Los Alamos National Laboratory in New Mexico. In California, he met former U.S. Secretary of State George Shultz at Stanford University and former U.S. Secretary of Defense William Perry. Perry is also a member of the CTBT Group of Eminent Persons (GEM). With former U.S. Secretary of State George Shultz. See also NNSA press release of 24 November 2015.